For LEGI R, the mounting of the grilles to the post basically takes place by bolting in the overlapping area of the grilles. 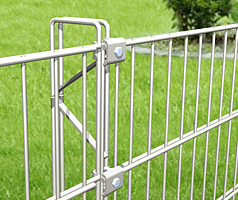 This creates a tight, compression-proof connection, which can securely transfer the forces received by the grilles to the post. 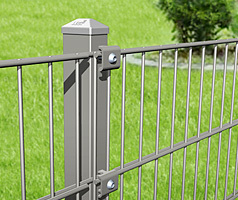 Only LEGI R has this type of grilles connection and already offers more security in its basic models. This variant is the filigree variant. It provides more transparency without compromising the proverbial LEGI stability. Filigree from the inside, linear from the outside. 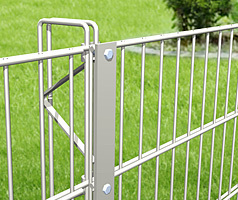 The clamping strip not only accentuates the posts, but also simplifies assembly. 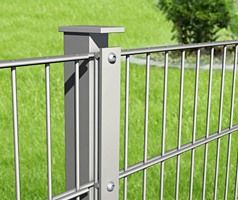 The continuous clamping strip for mounting the grilles gives the post a linear appearance.